Fan No. 2 is a roundup of Barbara Morgenstern’s extensive recorded output to date including previously unreleased versions and never before heard mixes as well as brand new exclusive tracks. As a special treat for fans of the Berlin singer, musician and producer, the double CD set includes a bonus CD of her two early EPs Plastikreport and Enter The Partyzone, which get their first official release here.The collection is a guided tour through Morgenstern’s catalogue starting from her first release on monika, Vermona ET 6-1, named after the cult organ that BM put to such great use on all of her early work. The version of Das Wort contained on Fan No.2 is a rarity that has its first proper release here. Then there’s Thomas Fehlmann’s Mix Expansion version of Der Augenblick; another previously unreleased track originally taken from the Fjorden album. There are 2 tracks from 2003s seminal Nichts Muss album: Aus heiterem Himmel and the title track, Nichts Muss. These are produced by scape label founder Stefan Betke aka Pole, who has also remastered all the tracks on this double CD set. 2006 saw Morgenstern shift slighty away from electronics towards a more organic sound with the use of traditional instrumentation. The piano version of The Operator is dedicated to Scottish pianist and composer Bill Wells (with whom Barbara has released on Leaf and Karaoke Kalk) and was so far only available on the single of this song. Camouflage from her last full length album, BM, represents another major milestone in the career of Barbara Morgenstern. She always wanted to work with Robert Wyatt and the dream came true with this delightfully moving song. The second number from BM to be included on Fan No. 2 is the anthemic Come To Berlin - a harsh criticism of Berlin’s city planning policy disguised in the form of a pop song promoting tourism in the German capital. This powerful hit appears in this collection as an brand new edit of the original 12” single track.Fan No. 2 draws to a close with 3 more previously unreleased tracks. Mountainplace originally appeared on Chicks On Speed’s acclaimed Girl Monster compilation, but the version included on Fan No. 2 is an exclusive version made by Mrs Morgenstern, new for 2010. Wegbereiter and Blackbird on the other hand, are both completely brand new exlusive tracks. 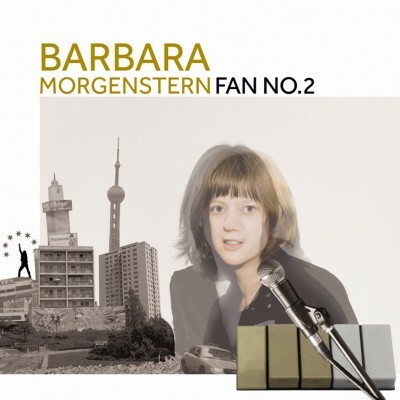 The first sees BM typically walking a fine line between kitsch and heart-wrenching while the later, a cover of The Beatles song, is unashamed uplifting pop as only Morgenstern can do and with it’s funky electronic production is surprisingly far removed removed from the original.Fan No. 2 charts the course of Barbara Morgenstern’s catalogue and the development of her style. Not quite a “best of” in the conventional sense of the term, but still packed with “hits hits hits”. In this respect it’s ideal for long-term fans, who will especially appreciate the bonus CD containing the rarities Enter The Partyzone (originally a cassette release in 1997 on Joe Tabu’s living room label, Hausfrau im Schacht) & Plastikreport (which was previously only available as a very ltd. release on Leipzig label Club der guten Hoffnung), as well as for any new listeners wishing to find out whats so special about Barbara Morgenstern’s music.